Trees line the initial stretch of San Diego County S-22 (Montezuma Valley Road) as it leads toward Rancheria. By the time it enters Borrego Springs, CR S-22 is fully within the desert environment. During summer, extreme temperatures in excess of 110 degrees Fahrenheit are not uncommon along the drive. 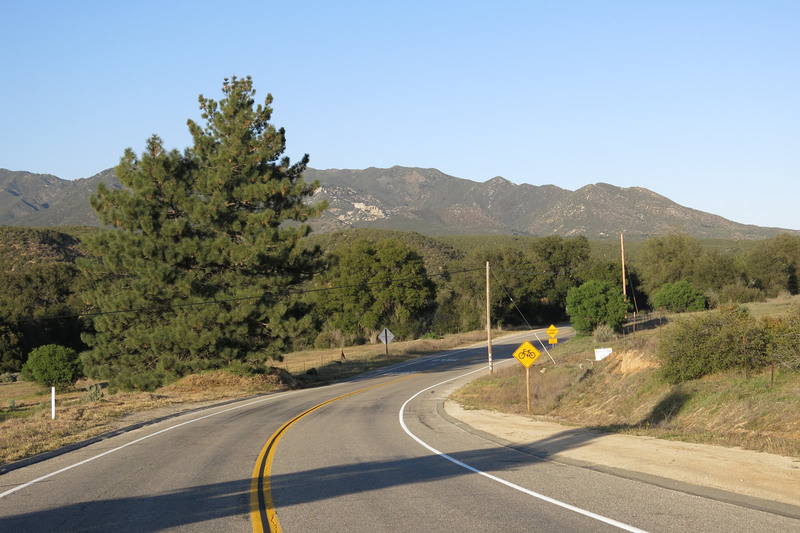 San Diego County S-22 (Montezuma Valley Road) begins and travels five miles east from San Diego County S-2 to Ranchita. The county road travels 18 miles to Borrego Springs and 48 miles to Salton City. Photo taken 04/20/13. San Diego County S-4 winds east around the northern periphery of the San Felipe Hills to Montezuma Valley. Pictured here is a reassurance marker at milepost 4 near the unincorporated community of Ranchita. Photo taken 05/29/02. A pullout overlooking Borrego Valley is located along San Diego County S-22 at Milepost 12.4. This section of highway was constructed between 1954 and 1964.1 Photo taken 04/20/13. Eastbound San Diego County S-22 enters Christmas Circle in the center of Borrego Springs. A small, landscaped park lies within the traffic circle. Photos taken 04/20/13. Heading through Christmas Circle, CR S-22 first meets Sunset Road southwest, followed by CR S-3 (Borrego Springs Road) south. Beginning here, CR S-3 travels south to meet California 78 in Anza-Borrego Desert State Park. Photo taken 04/20/13. San Diego County S-22 (Christmas Circle) next meets Avenida Sureste before resuming along Palm Canyon Drive east three miles to Borrego Valley Airport (BXS). Photo taken 04/20/13. Beyond Borrego Springs, CR CR S-22 bee lines east through more of Anza-Borrego Desert State Park en route to Salton City. Photo taken 04/20/13. Leaving the central business area of Borrego Springs, eastbound San Diego County S-22 (Palm Canyon Drive) meets Borrego Valley Road at this intersection. Borrego Valley Road heads south to San Diego County S-3 (Yaqui Pass Road) and north to local ranch areas and citrus orchards located to the north of the valley. Photos taken 04/20/13. The expansive desert of Clark Valley opens along San Diego County S-22 (Borrego Salton Seaway) east in this scene at milepost 27 in Anza-Borrego Desert State Park. The county road turns southeast ahead of the distant Santa Rosa Mountains. Photo taken 04/20/13. Several washes and small ravines were filled to allow San Diego County S-22 a relatively flat trip across the desert. Older design standards along this section include small boulder curbing, as well as culverts to carry excess storm water under the roadway. Photos taken 04/20/13. One of the ravines cut by the washes on the south side of the Santa Rosa Mountains. San Diego County S-22 surmounts several such ravines on its eastward course. Photo taken 04/20/13. County Road S-22 (Borrego Salton Seaway) crosses the Imperial County line in a broad valley east of the Santa Rosa Mountains. Photos taken 04/20/13. Imperial County S-22 proceeds through the badlands located between the county line and Salton City. The county road gradually drops to below sea level prior to entering Salton City. This scene looks near the turnoff to Ro-Geo Notch overlook. Photo taken 04/20/13. The final Imperial County S-22 route marker stands one half mile ahead of California 86 at Sunset Avenue in Salton City. Salton City had a population of 3,763 as of the 2010 Census, and it sits at an elevation of 125 feet below sea level. Photo taken 04/20/13. Gas and food are available at the upcoming intersection between CR S-22 and SR 86. Founded in the 1950s with the intention of creating a resort complete with beach and marina amenities, Salton City is an unincorporated community located on the western shore of the Salton Sea. Plans for the resort were realized for a time, but over the decades, and for a variety of reasons, the development never really succeeded. Issues included significant changes in the water level within the Salton Sea, as well as water quality. Despite this, most development is now clustered closer to the California 86 corridor, which had been widened to expressway standards during the 2000s. Photo taken 04/20/13. SR 86 is a major, north-south expressway that replaced Historic U.S. 99. The expressway corridor from Calexico to Indio incorporates portions of SR 111, SR 78 and SR 86. The Borrego Salton Seaway concludes here, but the road continues ahead as South Marina Drive. Remains of the resort and the dozens of roads that were surveyed and constructed as part of the original development are located east of the expressway. South Marina Drive overall approaches the edge of the Salton Sea, then loops back to SR 86 as North Marina Drive. Photo taken 04/20/13. Traffic lights were installed at CR S-22 (Borrego Salton Seaway) and California 86 in 2015. California 86 travels 35 miles north to Indio and 49 miles south to El Centro. Photo taken 04/20/13. Imperial County S-22 proceeds west along Borrego Salton Seaway from California 86 in Salton City. Photo taken 04/20/13. Borrego Salton Seaway remains below sea level initially while in Salton City, but quickly rises into the badlands southwest of Clay Point. Photo taken 04/20/13. Mountains in San Diego County loom in the distance, and the Borrego Badlands can be seen in the foreground. Imperial County S-22 is exemplary for scenery. Photo taken 04/20/13. Imperial County S-22 gains elevation through a series of S-curves preceding the Borrego Badlands area within four miles of Salton City. Photos taken 04/20/13. Two miles ahead of the San Diego County line, a reassurance marker for CR S-22 is posted. Now well above sea level, Borrego Salton Seaway advances west toward the Santa Rosa Mountains. Photo taken 04/20/13. Crossing into San Diego County, County Road S-22 also enters Anza-Borrego Desert State Park. Photo taken 04/20/13. Recreation opportunities within Anza-Borrego Desert State Park include taking in scenic overlooks, hiking and wildlife viewing. Photo taken 04/20/13. Leaving the badlands area, San Diego County S-22 descends into the broad Clark Valley. This stretch of road is prone to flooding during summer monsoon storms. Photo taken 04/20/13. San Diego County S-22 makes a 90 degree turn at Henderson Canyon Road by the south end of Coyote Mountain. Henderson Canyon Road extends west to agricultural and ranch areas in north Borrego Valley. Photo taken 04/20/13. Peg Leg Road leads CR S-22 south 2.4 miles to Palm Canyon Drive west. The Vallecito Mountains rise far to the south. Photos taken 04/20/13. Palm Canyon Drive turns CR S-22 west to Borrego Valley Airport (BXS) and the community of Borrego Springs. Borrego Valley Road provides a cutoff south to San Diego County S-3 (Yaqui Pass Road). Photo taken 04/20/13. Advancing 1.5 miles west from Borrego Valley Road, CR S-22 (Palm Canyon Drive) enters Christmas Circle in the center of Borrego Springs. Photo taken 04/20/13. Borrego Springs Road stems north from Christmas Circle as a local route to agricultural areas in north Borrego Valley. South from CR S-22, the highway carries CR S-3. Photo taken 04/20/13. San Diego County S-22 resumes along Palm Canyon Drive west back into Anza-Borrego Desert State Park. San Diego County S-3 south connects Borrego Springs with California 78 in 11.5 miles in the Lower Borrego Valley. Photo taken 04/20/13. Gas and food options are available along Palm Canyon Drive leading west from Christmas Circle. County Road S-22 is otherwise devoid of services to the western terminus. Photo taken 04/20/13. San Diego County S-22 turns south onto Montezuma Valley Road at the west end of Borrego Springs. CR S-22 will assume a mountainous configuration from here to Ranchita with several grade changes and sharp curves for the next several miles. Photo taken 04/20/13. Reentering Anza-Borrego Desert State Park, the scenic drive along Montezuma Valley Road winds southward toward Dry Canyon. Peninsular Bighorn Sheep are known to frequent the area during the early morning or late afternoons. Photos taken 04/20/13. Winding southward and continuing gain elevation along CR S-22 west ahead of Culp Canyon. Photos taken 04/20/13. The Montezuma Valley Road Lookout and interpretive sign are located near milepost 12.5. Photo taken 04/20/13. Reaching the top of Montezuma Grade, westbound San Diego County S-22 (Montezuma Valley Road) again expands to include a passing lane. Beyond the passing lane, CR S-22 resumes through rugged terrain leading into Culp Valley. Photos taken 04/20/13. Westbound San Diego County S-22 enters Ranchita and sees a long straight away across Montezuma Valley. Photo taken 04/20/13. San Diego County S-22 takes a winding course west from Montezuma Valley to its end at San Diego County S-2 (San Felipe Road). Photo taken 04/20/13. CR S-22 ventures southeast through San Felipe Valley en route to Ocotillo. San Felipe Road continues the county road 4.7 miles west to California 79 near Warner Springs. Photo taken 04/20/13. The view east toward Borrego Springs from the Monezuma Valley Road overlook located along San Diego County S-22 near milepost 12.5. Photos taken 04/20/13. Interpretive signs at the Monezuma Valley Road overlook provide information about Borrego Springs, Anza-Borrego Desert State Park and native Peninsular Big Horn Sheep. Photos taken 04/20/13. Imperial County S-22 has several paved and unpaved overlooks in the Borrego Badlands area. Pictured here are scenes from the Ro-Geo Notch overlook, located just a couple miles east of the San Diego-Imperial County line. The Salton Sea and Salton City are visible to the east from this vantage point. Photos taken 04/20/13. DPW Stories: Desert Roads Paved With Past. http://www.sdcounty.ca.gov/dpw/organization/desertroads.html San Diego County Department of Public Works).